In business since 1982, we are located in Munster, Indiana. We have established a fairly vast service area, both in customers and our mobile repair service. We currently have A 50-mile delivery radius with our truck and we also ship UPS and Fed-Ex. Our location is currently home to the best Parkerstore™ in the area. Our business office’s shipping and receiving (12,000 sq ft) warehouse comes to you fully stocked with hose and fittings and a knowledgeable Parker trained staff. 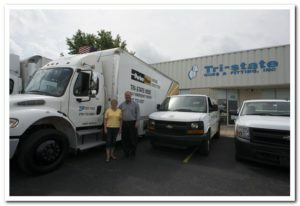 At Tri-State Hose and Fitting our goal is to provide you with courteous, expedient, professional service of the highest caliber. Our staff offers quality and reliable products that you can count on. In addition, our professional and friendly staff is here to answer any questions that you may have about our products and services. Browse our Web site for more information about Tri-State Hose and Fitting. If you have any questions or would like to speak with a representative regarding our products and services, please e-mail us at tri-state@tristatehose.com or call us at (219) 922-9700. Founded in 1982 Tri-State Hose and Fitting quickly found its niche by providing quality custom-made hydraulic hose assemblies and on-site mobile repair to industries in the greater Indiana/Illinois region. Tri State Hose established its roots by servicing small businesses located in and around the steel industry of Northwest Indiana and Chicago. They quickly realized the value of a business model focused on providing exceptional service and that model is still the cornerstone of Tri-State today. Through the years this model has grown and expanded. In 1992, Tri-State began participating in Parker’s Hose Doctor program which offers emergency mobile hose repair 365 days a week, 24 hours a day. To support this effort, the company purchased large box trucks to house equipment and parts that could be brought directly to the customer site where repairs could be made quickly. Tri-State was purchased by Ritter Technology in April of 2017 and is now a division of Motion & Control Technologies. Tri-State Hose. Your Resource for Automation Expertise.